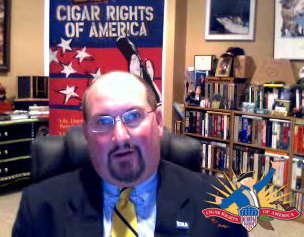 Last night, Cigar Rights of America held their first “CRA TV” webcast. The broadcast streamed live from CRA headquarters and featured CRA Executive Director Glynn Loope speaking about CRA’s important mission and how the group, which is less than two years old, is working to accomplish its goals. Loope described the founding of CRA, citing a profound need for the voice for cigar consumers during the SCHIP tobacco tax battle. He then provided a comprehensive list of the states where CRA has been active in the past two years fighting smoking bans (NC, SD, CO, KY, NE, IN, PA, AL, MI, TX, LA, VA, KS, CT, WI, and NV) and fighting tobacco taxes (KY, AR, HI, CA, NH, OR, PA, UT, MI, FL, NY, WA, and MA). Loope reminded viewers that these battles are important not only for the states directly affected, but because opposition sends a message to those considering similar measures elsewhere. For example, he sees a legal challenge to the New York City law mandating graphic anti-smoking propaganda posters be displayed whereever tobacco products are sold as critical not just for New York but because Boston and possibly other cities are considering similar measures. Loope also reported on the ongoing rule-making process regarding FDA oversight of cigars. According to Loope, there is “no greater threat” to the cigar industry than FDA regulation of cigars. Also addressed were the results of the recent election. CRA had endorsed four candidates for governor, 18 candidates for the U.S. House of Representatives, and two candidates for the U.S. Senate. According to Loope, all of these candidates won their races (except for two in the House), although two of the gubernatorial races were too close to call at the time of the broadcast. Loope announced that the CRA TV broadcast would become a regular weekly way of communicating with members and cigar consumers. Next week’s show, scheduled for Friday, will be live from Casa Fuente in Las Vegas; the exact time has yet to be announced. Two other announcements were made on the broadcast: First, a new CRA Cigar Sampler will be coming soon. Like past samplers, revenues will support Cigar Rights of America. It is expected out for the holidays. Second, a consumer advisory council will be formed to further ensure that cigar consumer voices are heard, although no details were released about the board’s composition. I was fortunate enough to be in the on-line audience for the first C.R.A. Net TV broadcast. Glynn Loope was excellent. I hope everyone tells their friends & the Viewers jump by the thousands. If we are to survive. We must support eachother.